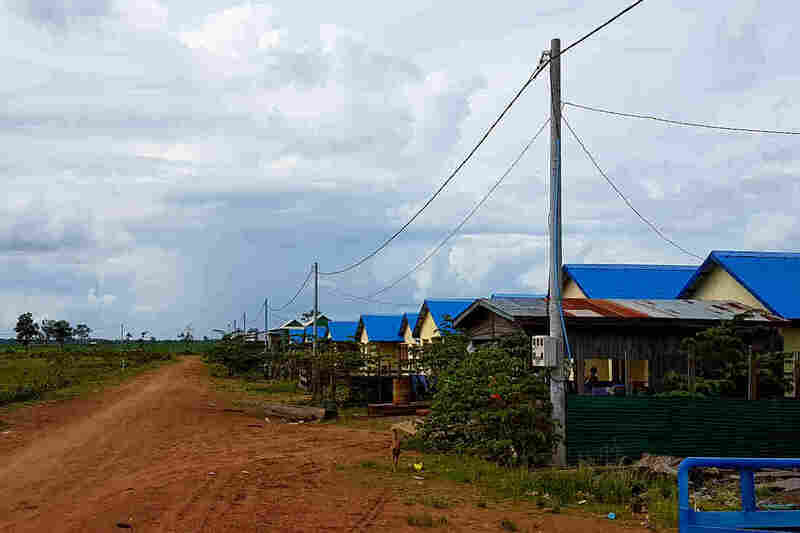 'I Will Lose My Identity': Cambodian Villagers Face Displacement By Mekong Dam : Parallels Thousands are being displaced by new dam construction. "I cannot leave my ancestors here," says a woman whose village will be submerged by the dam. "If I abandon them, I won't know who I am." 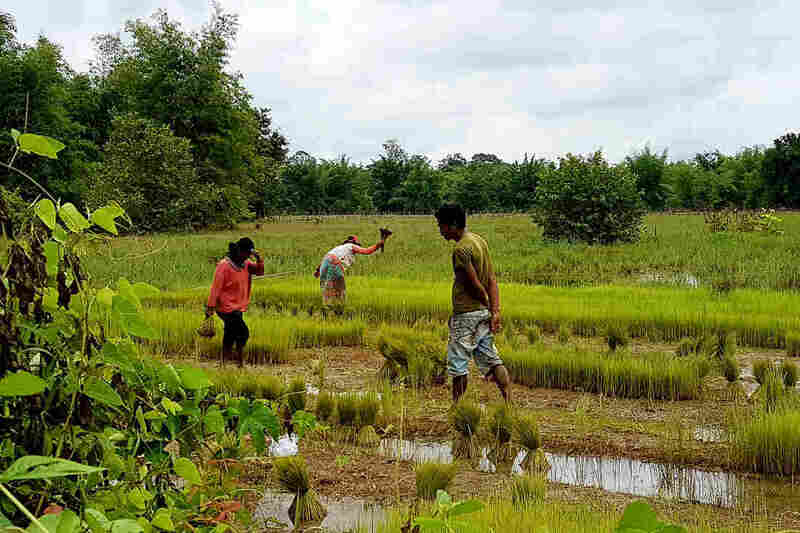 Villagers plant rice in Srekor village. Most residents of the village — which will be submerged when a new dam starts up — have been relocated. Most of Srekor's residents — about 400 families — have already been resettled in a new village about an hour's drive down the road. Fisherman Fout Kaeun isn't one of them. "You see that we live next to the river," he says — a river that provides almost everything. "We can catch fish to eat, it provides water to drink and the land alongside is good for growing crops." He says there's no way he's going to the new village. "There's no river there," he says. The soil's no good, either, he says: "You can't grow anything, so how will I survive? How will my family survive?" Kaeun doesn't believe Srekor village will be entirely submerged by the dam. But if it happens, he says, "We just make it a floating village, a tourist attraction" — like the one on the Tonle Sap lake, near the temples of Angkor Wat. If the villages do that, he says, they can also protect the forest nearby. And everyone, he says, can make money. A lot of people are already making money from cutting down Cambodia's forests to sell its luxury hardwood abroad. Some indigenous villagers here say the new dam is helping hasten their forests' destruction. 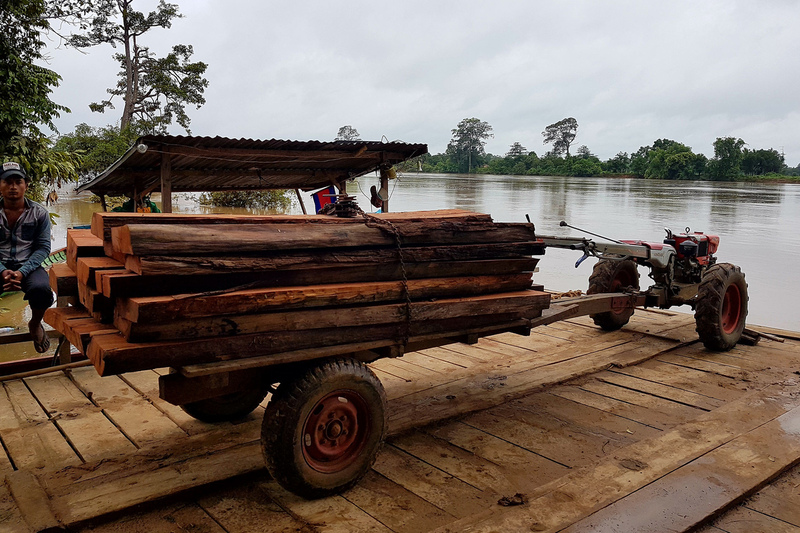 Freshly cut timber is transported across the Sesan River toward the dam construction site. Villagers claim illegally harvested hardwood is being laundered at the dam construction site. "Before, we used to cut some trees," says Vann Oun, a 40-year-old resident. "But just for our houses, not to sell to Vietnam and to China." As we talk, a makeshift ferry on the edge of the village is filling up with small tractors stacked high with freshly cut timber, waiting for the short journey across the river, and from there, to the dam concession area. The wood isn't legally cut. Cambodia's hydropower projects and economic concession areas have become notorious for laundering illegal timber. If a company needs to clear timber from a site for construction — say, for a dam — that's considered legally cut timber that can be sold. And if illegally cut timber can be funneled to those sites, and is claimed as being felled there, it's considered legal too, and ready for export. Oun says that's been happening since construction began nearly five years ago on the Sesan 2 dam. "The company says they were just clearing the reservoir, but that's not true," he says. "They're having people bring wood to the dam concession area from all over the province." The joint venture in charge of dam construction denies these allegations, even as it and the government tighten the screws on those still refusing to leave the two villages upstream. In late July, they began filling the dam reservoir for "operational testing." And parts of Srekor ended up knee-deep in water. Nat Sota, 64, says it was meant to scare holdouts like her. "They were just trying to test us," she says, "to see if we'd leave." The government has pulled the teachers from the village school, emptied the local Buddhist temple of monks — and sometimes blocks the road to the village to keep nosy visitors away. Sota says it's not going to work. She is from the indigenous community here, with a strong connection to the land. New housing has been built for villagers who agreed to be resettled from Kbal Romeas. The new village is far from the river, so they have to pay for food and water now. Some complain they have not been compensated as they were promised. "I cannot leave my ancestors here," she says. "I can't abandon their spirits. If I do that, I will lose my identity. If I abandon them, I won't know who I am." As for the resettlement villages, they are bleak. One of them, New Kbal Romeas, is on the main highway and easily accessible. It's a collection of newly built houses. There's electricity, but little else. It's just as the folks back in Srekor had predicted — and feared. "Here we have to buy our fish from the vendors, and we have to buy our water from them too," says Im Chin, 22. "Before, we could get both from the river." She says her family can't grow much on the land — and it's less than what they were promised. "I'm angry with the company," she says. "They promised adequate compensation for us, but they didn't provide what they promised." It's not just the villagers of Srekor and Kbal Romeas whose lives are being upended by the new dam. There are millions of people living downstream along the Mekong who depend on the river for their livelihoods. And the three river systems that converge just upstream of the Sesan 2 dam are part of that ecosystem. "Lower Sesan is one of the most impactful projects on tributaries, because it is, downstream, the largest tributary of the Mekong," says Marc Goichot of the World Wildlife Fund's Greater Mekong Program. And, he says, it is "one that is very important for both sediment management for the Mekong and even more importantly for fish migration." Messing with sediment flow — the sand, silt, soil or other solids rivers carry downstream — could affect agricultural production downstream. Messing with fish migration — the ability of fish to travel freely up and downstream to spawn — could mean fewer fish in the future. Courtney Weatherby is a research analyst for the Southeast Asia program at the Stimson Center in Washington, D.C.
"Some experts have estimated that just the single dam, the Lower Sesan 2, may impact 9 percent of the fisheries of the entire Mekong basin," Weatherby says. "So that would be a significant loss from just one project." Less fish, in a region where fish is a cheap and nutritionally vital part of many people's diets. Goichot warns of the long-term impact of large dams like the Sesan 2 in the lower Mekong region. "It's death by many cuts," he says. "And what we're seeing is the Mekong river system is reacting faster and to a bigger extent than other large rivers. So the current levels of change already happening in the Mekong basin are already having some serious impacts downstream on channels of the Mekong but also clearly on the Mekong delta, which is sinking and shrinking." Meanwhile, Cambodia plans to build two more dams on the Mekong main stem, below the Sesan 2. Upstream on the Mekong, in neighboring Laos, two new dams are already under construction.